New Zealand has a thriving local reggae scene that is still mostly denied the international recognition it deserves. One of the few local groups that has toured the world is Katchafire from Hamilton, the center of New Zealand‘s fourth largest urban area, situated 80 miles south of Auckland. Katchafire is one of the most succesful groups in the country‘s musical history. Their four studio albums have all been awarded with platinum. 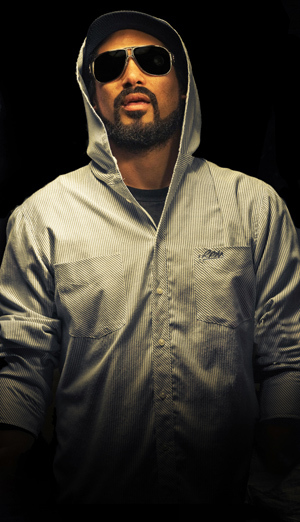 REGGAEVILLE called Logan Bell, the group‘s lead vocalist, while he was in London to promote Best So Far, a best of compilation that makes Katchafire‘s greatest successes available for fans in Europe and North America. Katchafire was established in 1997 as a Bob Marley cover band. What was your motivation to do it at the time? How did you get together with your band colleagues? You know, we just used a lot of odds to match. We kinda were musicians and jamming, going through music school and performing arts. We just loved playing the songs. And all the people, we loved to sing, we loved to harmonize together. We just used to come together and sing and learn the songs and kind of create our own kind of versions, our own take of a lot of Bob's songs. My father actually had a vision to start a reggae band. The vision was born with him. He left home and hired some inner city apartments where we could make noise and practice and record music. That's how we got started. We just really knocked on a lot of the night clubs and restaurants and bars and asked if they wanted a reggae band for entertainment. From the very first gig, we got paid nothing, but the fans, the people really loved listening to the music, to the songs, our versions of Bob Marley covers. So we saw right away that there was a big, I guess, want in the market for reggae music here in New Zealand. From strength to strength every gig - I've never played to an empty room. What fascinated you so much about Bob Marley's music that you decided to cover his songs? Yeah, we're very Marley-centered. Look, I think he had all the ingredients that appeal to us. He's got a serious conscious voice and a fun vibe and good time vibe and a togetherness vibe. He talks about a lot of conscious issues and struggle. All of that, all the right ingredients that no other artist had. It just appealed to us as group of friends and musicians. This is our, I guess, tribute to him. Which other musical influences are important to Katchafire? We like to harmonize, so we love the early Wailers' era, where it was just all of males. We love other great male groups, like Steel Pulse, Aswad, Gladiators… Peter Tosh, we love Peter Tosh! Mighty Diamonds… Pretty much that era that was all male vocals. That extends outside reggae, too. There's other groups. Eagles, the Little River Band - there's some great vocalists, male vocalists on that. You know, the vocals is definitely one of our focal points, and harmonizing in particular we love to do. How did Katchafire evolve from a Marley cover band to a group that records and performs its very own music? Definitely it was a natural process. I think that got us very early on. I mean, I was writing music before we started Katchafire. But I think, what playing the covers did was - it was like a school, a university in deep reggae music, deep roots. When we were learning the songs, we were actually studying the greats and how they write these great hits, these wonderful songs. I think that helped us, gave us confidence, an ideal, and inspiration for our own, you know, writing our own songs. Your first studio album, Revival, dropped in 2003. It went double platinum. What did you feel when you started to realize the album's tremendous success? It was a pretty quick - I mean, we actually won a talent search. The prize was 5,000 dollars of recording time in a real studio, in a proper studio. And we won that. And we went in and we recorded Giddy Up and Bounce. We were very much still a cover band at the stage. We started to make a name for ourselves and got some bigger gigs. We got scouted by a talent agent. One of the songs that we recorded was the biggest selling single in 2001. Once we sort of signed up with the label that released our first single, it happened very quick. The name kinda got out there. We followed the single up with another single, I think maybe three singles before we released the album. So from around early 2000 to 2003, by the time we dropped the album, Katchafire was a household name. It was a very, I guess, quick rise. I think it's done way more than double platinum now, it's like definitely triple platinum or maybe even more when you add up the world sales. That's just New Zealand. We were stoked and excited and testament to how much people love reggae music. I must admit that it's not been too long ago that I first learned about reggae in New Zealand. It is pretty much the end of the world from where I livc. In recent years, there has been a number of reggae bands from New Zealand appearing on European and American stages, bands like Black Seeds, Fat Freddy's Drop, or Katchafire. Could you tell me more about the reggae scene there? Throughout the whole Pacific, throughout the whole world actually there's been a huge revival of reggae music. Nowhere else in the world is it stronger than at home here in New Zealand. And the scene just has so many, I guess, different strains of reggae music. There's over one hundred bands in New Zealand that play in the genre of reggae music. For a little country of four million people, that is a lot of reggae music bands. It's crazy. It's happening in Australia, it's happening around the Pacific, it's happening in the west coast of America. I haven't seen too much of a Pacific lead vibe happening in the UK, Europe yet, but it's definitely led by Panasian, Pacific and indigenous nations. It's huge, man. It's amazing. You are said to be the hardest working band found in New Zealand. You have done crazy stuff like touring 49 weeks of a year and performing live from Thursday to Saturday each of these weeks. You've once played three gigs on a single day. How do you achieve that? Don't you ever get tired of working so restlessly? We haven't done 49 weeks of a year for a few years now, so we're definitely taking a little bit more time. You know, over the years we got a bit wiser and are taking a little bit more time. It's about nine months of the year we travel now, throughout the world. We get to come home in between a lot. We gotta keep the balance. It can get a little bit overworked, you know, or tired of things. But when it really comes down to it, this is our dream, man. It's what we love to do. And too many weeks at home doing nothing, we start getting bored, man. How do you stay in form and healthy when you're on the road? Definitely, sleep is the most precious commodity on tour. When you're doing gigs every day, especially when you're a vocalist, you gotta try not to talk. Everything further evolves around that. Getting enough rest and keeping your energies. Eat healthy, if you can - it's very hard on the road. Don't go to Denny's when you're in America. Sleep. Stay away from bad food. You're currently in the UK promoting a best of album. The idea behind it was to catch at the UK/Europe market. We haven't released a lot of our earlier albums in UK or Europe yet, so it is kinda like a fresh look at Katchafire for a lot of people that haven't heard about us in their territory. We're doing that release with VP Records. The idea was to get to catch up both Europe, UK, and America with the same-day release. I'm just thankful to people who went out and bought it. It debuted number four on the charts, on the Billboard reggae charts, so we're very happy about that and thank you if you supported the release. If you haven't got a copy, check it out! You are already planning a new studio album bound to drop in late 2013 or early 2014. Yes, we've already started work on our fifth studio album. I was just working on some stuff before you rang me. We got about six tracks down in various stages of the process. Maybe two of them are ready to go to mix and master. You could see a single or two in the coming months. It's definitely another notch up. The boys are bringing all of our powers and wisdoms combined to this release. I think it's an extension of On The Road Again, in the sense that it's the same five songwriters that assist in the matter of step up in the Katchafire evolution. Yeah, it's just that we can't wait to come back. It's been a couple of years since we were in the UK, in Europe. We just wanna spread the vibe. The fire is coming. Tell your parents and your brothers and your cousies. Come through to the his, man, we wanna share some beautiful vibes with the people. We got an awesome show for you.